Being Frugal and Making It Work: Win a Summer Camp Experience at Adventure Treks! Do you have a child between the ages of 12 and 15 that loves the outdoors? This could be the best summer experience of your child's life! 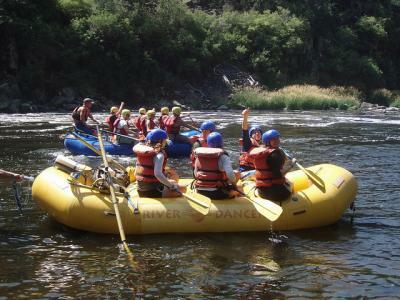 They could spend their 2013 summer outdoors: rafting, biking, climbing, camping and hiking in some of the most amazing scenery in North America! Make great new friends and grow as they succeed in new outdoor challenges. Click here for the official contest entry: Adventure Treks essay contest announcement! Scale snow-capped peaks you’ve only seen in postcards. Shoot towering rapids with your new best friends. Walk wildflower-laced trails by day and wonder at a twinkling sky by night. Cook crazy concoctions around a campfire and laugh more than you ever thought possible! Adventure Treks is all about making memories, fostering lifelong friendships and creating more confident and capable young men and women. We are a small and personal company and getting to know you is our biggest priority. But Adventure Treks isn't just about outdoor fun; it's about YOU! We want you to discover your best self, and we believe that the great outdoors is just the way to do it! Adventure Treks is more than a summer adventure camp. Our two, three and four week outdoor adventure programs for teenagers ages 12 - 18, help great kids build skills for future success. While our students are having the time of their lives rafting, climbing, hiking, and biking in some of the greatest scenery on the planet, something else is happening. They are growing in numerous ways: self- confidence, social achievement, teamwork, leadership and new outdoor skills, to name just a few. Receive a free Adventure Treks T-shirt! Space is limited Apply Today! Adventure Treks, the adventure program chosen by Good Morning America is priced on average 20% less than other programs, saving $600 on a typical trip. We provide outdoor equipment free of charge saving you an additional $500. If you decide to book a summer camp for your child, please use my name, Bridget from Being Frugal and Making it Work, as your referral! Have you or your child ever gone to a summer camp?